Lucky rabbit's foot key chains are sold in a variety of colors. A rabbit's foot, in most English-speaking countries, is considered a sign of good luck when carried on or near the body. Although the history of the "lucky" rabbit's foot is difficult to nail down, it is generally agrees that it became popular in America near the turn of the twentieth century. Of course, if the rabbit's foot is lucky, by extension, the converse is also true, and the absence of a rabbit's foot can bring an end to good fortunes. Although it is not clear why, throughout the ages, people have had the experience that carrying various kinds of objects has seemed to bring them good luck (or in some cases bad luck). Perhaps the object is a reminder that tends to focus their thoughts and energy, and it is actually the focus that brings along the beneficial results (or deleterious results in the case of an object considered unlucky). In any case, objects like the rabbit's foot have enjoyed persistent popularity over the centuries. The rabbit itself is generally imbued with a certain amount of superstition and symbolism. Rabbits tend to represent fertility. European Celts held rabbits to be sacred because they spent so much time underground; a sign they were inhabited by numina, or underground spirits. At the same time, some associated the rabbit with shape-changing witches, and certain elements of the rabbit foot tradition seem to reinforce this darker side: The left side of an animal, as well as its rear half, were considered to be shady, and had a negative influence. The rabbit's foot has been seen by many as a sign and carrier of good luck, while others have viewed it as a symbol of the forces of darkness; thus the power with which the rabbit's foot is imbued depends both on the observer and the observer's worldview. The rabbit's foot, in most English-speaking countries and especially the United States and Great Britain, is considered a good luck charm. In order for the rabbit's foot to be effective, however, it must be carried on one's person. Folklore often suggests that the left pocket is the best place to carry the left foot of a rabbit, but it is also common for them to be carried as around the neck or in a pocketbook—most rabbit foot owners are content with simply keeping it nearby. Thanks to the ease in creating inexpensive and abundant imitations, they have proven to be quite common. However, genuine rabbit's feet are still prevalent, and many animal rights activists encourage this particular tradition to die out. Such activists are not concerned with rabbit numbers so much as the manner in which rabbit's feet are harvested. Some traditions maintain that the rabbit must be alive when its foot is severed. In any case, the rabbit's foot is dried out and preserved, and commonly carried around by gamblers and other people who hope it will bring them luck. Rabbit's feet, either authentic or imitation, are frequently sold by curio shops and vending machines. Often, these rabbit's feet have been dyed various colors, and they are often turned into key chains. Few of these rabbit's feet carry any warranty concerning their provenance, or any evidence that the preparers have made any effort to comply with the rituals required by the original tradition. Some may be manufactured from fake fur and latex "bones." Rabbit's feet became popular in America starting in the early twentieth century. The history of the rabbit's foot before that, however, is not well documented. As such, several theories regarding the evolution of lucky rabbit's feet have developed. One theory states that ancient Europeans were amazed that, in gait, the rabbit's hind feet touch the ground before its front feet, and thus ascribed the hind feet magical properties. Some of the early roots of the practice come from Britain. It is known from Reginald Scot's 1584 records that people carried hare and rabbit feet to ease arthritic episodes. There are also reports of rabbit's feet being used to ward off witchcraft or guard against cramps. Some scholars argue the rabbit's foot originates in the system of African-American folk magic known as hoodoo. The various rituals, though they differ widely one from another, share a common element of the uncanny, and the reverse of what is considered good-omened and auspicious. A rabbit is an animal into which shape-shifting witches such as seventeenth-century Isobel Gowdie claimed to be able to transform themselves. Witches were said to be active at the times of the full and new moon. Silver bullets, of course, are reputed to be effective against uncanny creatures such as werewolves, and often silver bullets were prescribed to kill any rabbit that would be used to create a lucky rabbit's foot. These widely varying circumstances may share a common thread of suggestion that the true lucky rabbit's foot is actually cut from a shape-shifted witch. Indeed, some rituals require a rabbit to be shot in a graveyard at night in order for the foot to be effectively lucky. 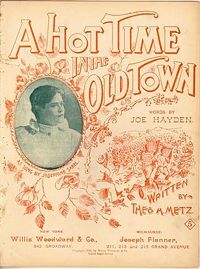 The cover to 1896 sheet music for "There'll be a Hot Time in the Old Town Tonight," which refers to a rabbit's foot, 'to keep away the hoodoo'. Hoodoo is a catchall phrase, originally used in a negative context by white slave traders and owners to describe traditional African folk practices. Hoodoo is not the same as voodoo, which is a Caribbean creole folk religion. Hoodoo was predominant in areas with large slave populations, as it was in Africa. In most cases, hoodoo is the modern practice of an ancient African magical tradition. The idea of hoodoo as one of the sources of the lucky rabbit foot is not all that far fetched. Indeed, early collections of African folklore are quite specific on how to prepare rabbits and their feet. Indeed, it is theorized that the African American interest in the rabbit's foot arose during a time of difficult relations between whites and blacks, and the rabbit's foot was seen as a way of circumventing white authority, especially law enforcement. The rabbit's foot then became popular with whites, following a pattern established by jazz music and rhythm and blues, where a once trivialized and ridiculed becomes a common point between two cultures. The suggestion that the rabbit's foot is a substitute for a body part from a witch's body is corroborated by other folklore from hoodoo. Willie Dixon's song, "Hoochie Coochie Man" mentions a "black cat bone" along with his mojo and his John the Conqueror: All are artifacts in hoodoo magic. Given the traditional association between black cats and witchcraft, a black cat bone is also potentially a substitute for a human bone from a witch. Hoodoo lore also uses graveyard dust, soil from a cemetery, for various magical purposes. Dust from a good person's grave keeps away evil; dust from a sinner's grave is used for more nefarious magic. The use of graveyard dust may also be a symbolic appropriation of the parts of a corpse as a relic, and a form of sympathetic magic. In addition to being mentioned in blues lyrics, the rabbit's foot is mentioned in the American folk song, "There'll Be a Hot Time in the Old Town Tonight," once popular in minstrel shows; one line goes: "And you've got a rabbit's foot To keep away de hoo-doo." President Theodore Roosevelt wrote in his autobiography that he had been given a gold-mounted rabbit's foot by John L. Sullivan as well as a pen holder made by Bob Fitzsimmons out of a horseshoe. A 1905 anecdote also tells that Booker T. Washington and Baron Ladislaus Hengelmuller, the ambassador from Austria, got their overcoats confused when they were both in the White House to speak with President Roosevelt; the ambassador noticed that the coat he had taken was not his when he went to the pockets searching for his gloves, and instead found "the left hind foot of a graveyard rabbit, killed in the dark of the moon." Other newspaper stories reported the incident but omitted the detail about the rabbit's foot. Humorist R. E. Shay is credited with the witticism, "Depend on the rabbit's foot if you will, but remember it didn't work for the rabbit." ↑ 1.0 1.1 Superstition Bash, Rabbit's foot. Website of the Committee for Skeptical Inquiry. Retrieved July 20, 2008. ↑ Dog Hause, Animal Superstitions N-Z. A Cafepress online storefront. Retrieved July 20, 2008. ↑ Cool Quiz!—That Explains It, Why is a Rabbit's Foot considered lucky? Retrieved July 20, 2008. ↑ 4.0 4.1 4.2 4.3 4.4 4.5 4.6 4.7 4.8 Bill Ellis, Why is a rabbit's foot lucky? Body part fetishes, Journal of Folklore Research, January 1, 2002. Retrieved July 20, 2008. ↑ Mami Wata Healers Society of North America, Hoodoo, A New World Name of an Ancient African Magical Tradition. Retrieved July 20, 2008. ↑ Bill Ellis. Lucifer Ascending: The Occult in Folklore and Popular Culture. (Lexington: University Press of Kentucky, 2004, ISBN 9780813122892). ↑ Joe Hayden, "There'll Be a Hot Time in the Old Town Tonight", reference site about folksongs maintained by Steven Schoenherr at the University of San Diego. Retrieved July 02, 2008. ↑ Louis R. Harlan, et. al., ed., The Booker T. Washington Papers. Open book Edition, Volume 8: 1904-1904, 437. Chicago: University of Illinois Press. Retrieved July 20, 2008. ↑ R. E. Shay, Quotations #2: Advice (Good and Bad), Quotations, an online reference site maintained by Steve L. Spanoudis. Retrieved July 20, 2008. Committee for Skeptical Inquiry. Rabbit's foot. Retrieved July 20, 2008. Ellis, Bill. Why is a rabbit's foot lucky? Body parts as fetishes. Journal of Folklore Research Indiana University Press, 2002. Mami Wata Healers Society of North America. Hoodoo: A New World Name of an Ancient African Magical Tradition. Retrieved July 20, 2008. The Lucky Mojo Curio Co. "Rabbit's Foot" by Catherine Yronwode at luckymojo.com. Saurin Desai, Lucky foot? Unlucky rabbit!, buzzle.com. This page was last modified on 22 June 2015, at 17:41.